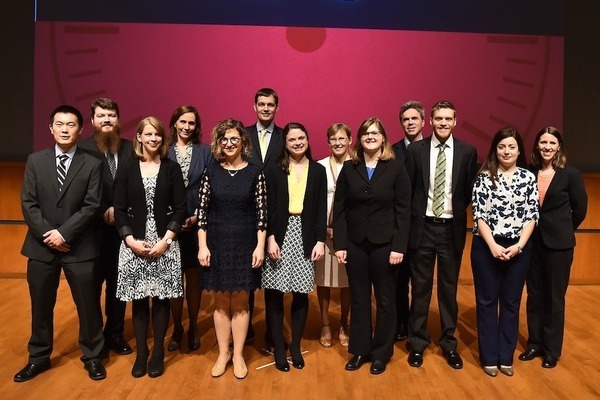 Mimi Ensley, a Ph.D. student from the Department of English, won the 2017 Notre Dame Graduate School Shaheen Three Minute Thesis Competition (3MT) on Monday night in Jordan Auditorium. 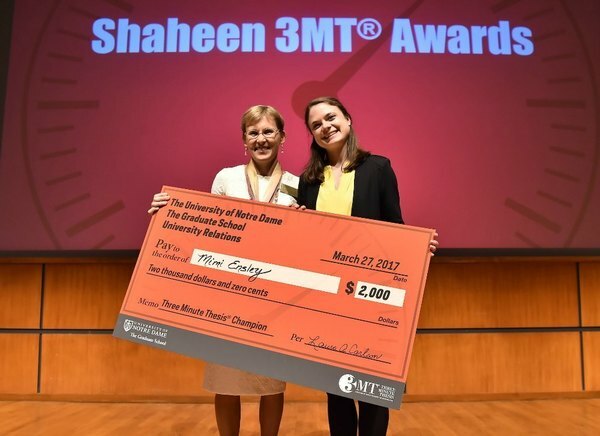 The Shaheen 3MT is a communication competition where graduate students from the Colleges of Engineering, Science and Arts and Letters try to effectively explain their research in a language appropriate to an audience of specialists and non-specialists alike, in three minutes or less. Competitors addressed a panel of judges in front of a live audience using one static slide as part of their presentation. Ensley, whose faculty adviser is Professor Tim Machan, was the fifth of the nine competitors to present. (From left) Contest judge Anne M. Firth, people’s choice winner Mingming Cai (electtrical engineering), judge Ralf Bendlin, winner Mimi Ensley (English), judge and dean of the Graduate School Laura Carlson, second-place winner Julia Beck (biochemistry), and judge Jim Keenan. Initially nervous about her speech, Ensley said she drew strength from the support of an audience that contained many of her colleagues from the English Department and elsewhere. All three 3MT finalists from the College of Arts and Letters hailed from the Department of English. 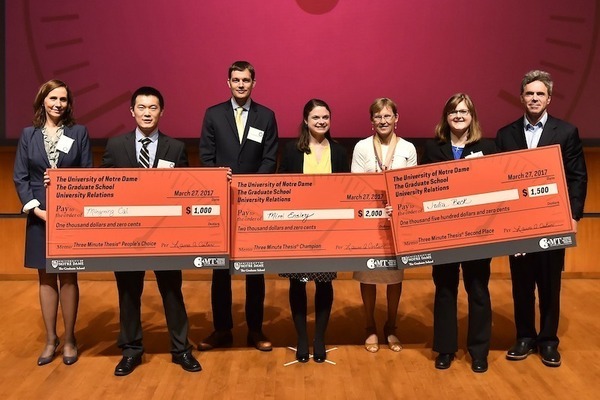 Ph.D. students Jillian Snyder and Nicole Winsor were the other finalists. A successful 3MT presentation may contain some of the same elements as a stirring dramatic monologue with equal parts emotional and intellectual intensity. As in its theatrical counterpart, a 3MT presentation can set a scene, reveal passions, and command the attention of an audience with conviction and poise. Ensley bested the other eight finalists for a top prize of $2,000. A second place prize of $1,500 went to Julia Beck (chemistry and biochemistry) and $1,000 to the people’s choice winner, Mingming Cai (electrical engineering). Ensley’s presentation, “Transmedia Traditions: Re-Making Medieval Romance,” told the story of a book. Not the story in a book, but the story of a particular book. More precisely, the 16th-century romance, Richard Coer de Lyon. Ensley’s dissertation asks: Why would a frivolous story of questing knights and marvelous dragons, previously viewed as aesthetically unpleasing with little value beyond surface level entertainment, last well into the 18th century and beyond? Ensley is interested in exploring how the medieval romance and its persistence in popular print helped to frame an idea of the middle ages for readers living in a rapidly changing post medieval world. Ensley says, “By looking at the material evidence of the people who both produced and read Middle English romances in the century after printing came to England in 1476, my research gives us a new way to think about how post-medieval cultures understood, and even constructed, the period we now call the Middle Ages. More broadly, by better understanding the experiences of past readers, we can, in turn, better understand how narratives, like those in my research, frame our own responses to the past." Ensley will move on to represent Notre Dame at the Midwest Association of Graduate Schools (MAGS) competition in Indianapolis on April 7.